Considering my love for books, imagine what an unexpected free book would mean to me! When I requested Alexander Strauch’s Biblical Eldership for review Lewis & Roth publishers sent two extra books for free! Love or Die was one of these bonus books. Their generosity was a blessing to me, and is much in line with the message of this book. 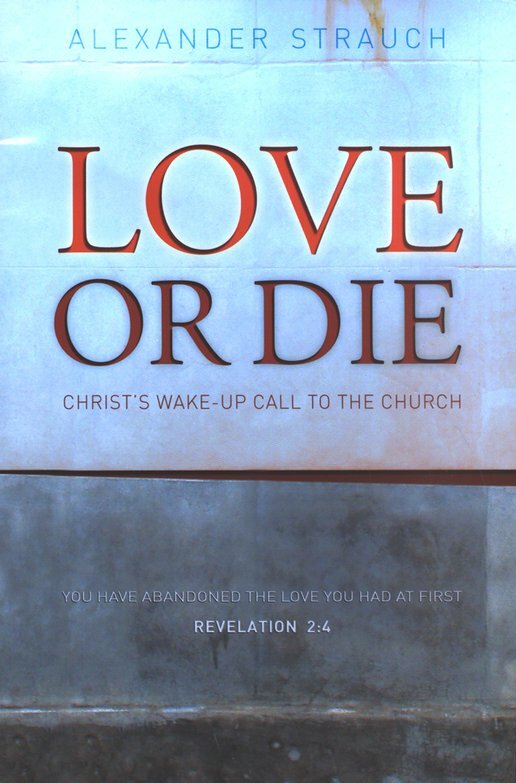 In Love or Die Alexander Strauch reveals his concern for the lack of love in many churches today, and hopes to help restore love to its correct place. 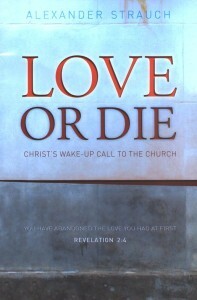 He sees this issue as, “of utmost importance because love is vital to the survival of our local churches today” (p4). This small book is split into two sections and a study guide. In part one, Strauch introduces the issue by expositing Jesus’ rebuke and remedy to the Ephesians; an apparently ‘perfect’ church that has in fact lost its first love. He shows how this church was commended for doctrinal purity, but lacked its first love. In the example of this church, Strauch wants to encourage his readers to examine their own lives and churches and whether Christ’s rebuke and remedy applies to them. Have we neglected love? “For this church, the way forward is by going back: clearly identifying what they had lost and acknowledging their fallen, sinful condition.” (p21) How then do we ‘go back’? In part two Strauch gives six suggestions for how the church can return to a healthy pursuit and cultivation of love. Through exposition, personal examples, and great quotes Strauch offers his pastoral encouragement to pursue love. He helpfully shows that love must be cultivated and sought after, and while this must begin in the church leadership, it cannot end there. Biblical love must be correctly understood, it must be sought after in prayer, it must be taught to the body, it must be modelled for others, it must be guarded against attack, and it must be practiced! Strauch is helpfully broad here; the battle for love has many facets, it begins with understanding the Scriptures, includes prayer and correct teaching, but it doesn’t exclude simple, practical application. I have two small criticisms. Firstly, since the Ephesian church seemed particularly strong in resisting false doctrine it would have been interesting if Strauch had considered how Christians can and should love Christians of different denominations without compromising their own doctrinal positions and convictions. How do these two things play themselves out? Secondly, Strauch doesn’t spend much time addressing idolatry and its threat to Christlike love. Strauch sees the “works [the Ephesians] did at first” to be acts that resulted from love but Jesus says that returning to the first works is actually part of the solution. If I am right and the ‘first works’ are actually referring to renouncing idolatry (see my post on Ephesian idolatry), then rather than a result of the original love, they are in fact central for regaining their original love (Rev 2:5). This is not unimportant: we need not only focus on regaining our love, but our love will flourish when personal idols are destroyed. Even if idolatry wasn’t at the heart of the Ephesus church’s problem this is still an element of regaining our love that I wish Strauch had emphasised more. I don’t want to end on criticism, since this is an excellent book. Strauch’s writing is clear and pastoral; he knows how to both explain Scripture clearly and probe his reader’s hearts! This book was a pleasure to read, and since it weighs in at 69 pages (before the study guide), even a busy pastor doesn’t have an excuse to avoid this book and its call for an essential Christian virtue: love. The exhortation to pursue love is much needed in our churches today, and for this Strauch must be commended. He has produced a penetrating and important book in Love or Die. Strauch has a wonderful ministry to the church in producing materials such as the classic Biblical Eldership, and others on the topics of deacons, resolving conflict, and hospitality. This book contributes a neglected but vitally important part to his faithful life of ministry to the church. This book is best read by pastors, but any Christian would benefit. Perhaps you could buy your pastor a copy, buy one for yourself, and help support him pursuing love in the church? “The First Works”—Idolatry in the Ephesian Church?